I’ve limited my domain purchases in recent years, and even let some of my bought-on-a-whim domains go (wordplumbr.com) after years of paying for renewals without using them. But I still went ahead with the purchase of pencoyd.app when Google opened up that new TLD. No specific plans for the new domain, so for now, I’ll link it to this post. I’ll leave the other 1,500+ possibilities alone. I did a double-take when I saw today’s New York Times headline “A Big Step in Roger Federer’s Comeback, but a Gantlet Awaits Him” because I always thought the correct word is gauntlet. But I learned something new today, courtesy of Grammarist. Gantlet was the original spelling of the word referring to a form of punishment in which people armed with sticks or other weapons arrange themselves in two lines and beat a person forced to run between them. Both words are accurate, with slightly different contexts, although often used interchangeably now. The New York Times, of course, used the word properly. Am I done learning today? Hope not. As a new administration prepares to take office this month, I’m concerned about attempts to rewrite history. All of which made me wonder about the history of WhiteHouse.gov. After literally wondering about this in the middle of the night, I researched enough to be able to sleep easier (on this front) going forward. Digital history is being preserved, however imperfectly, and our responsibility as citizens to learn from our past enjoys a firm foundation. 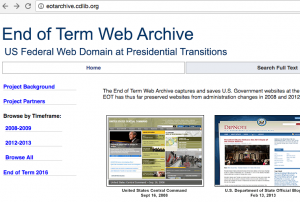 The first public website for the White House was developed in 1994, during the Clinton administration. As noted in the quote above, the National Archives have versions of the Clinton website, both the final version and final version, but impressive collection of other versions and other historical documents is found within the Clinton Digital Library, with links to official government hosting. 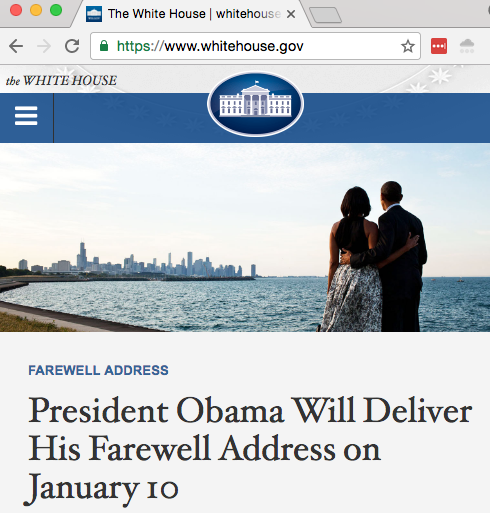 The final WhiteHouse.gov from George W. Bush, too, is hosted officially by the government at https://georgewbush-whitehouse.archives.gov/. History and (even better) version control for laws and public documents of all kinds makes sense and helps us hold each other accountable over time. That doesn’t mean it’s easy, so I’ve made a small donation to the Internet Archive, inspired by what they’ve already achieved and to support more work here. You can donate, too. I’m drawn to this subject not simply because of political shenanigans or concerns over how America holds itself accountable during the coming years, but because on a personal level I’m working to rehabilitate my previous years of blogging, currently offline in a WordPress XML archive. From March 2003 to January 2012, I published 1,465 posts at http://www.pencoyd.com/clock which are currently offline. I’m working on resurrecting that archive next. I’ll use https://clock.pencoyd.com/ as the blog home going forward. Small irony, given my past work life: I needed to allow web.archive.org as a Proxy/Anonymizer in my OpenDNS parental controls to view the old versions of my blog.